William George "Bill" Doneski Sr. 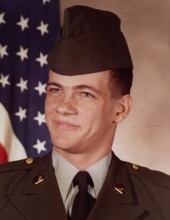 Celebrating the life of William George "Bill" Doneski Sr.
Obituary for William George "Bill" Doneski Sr.
William George "Bill" Doneski Sr, age 57, of Knoxville passed away Friday, November 2, 2018. Bill was a graduate of Farragut High School. He was a veteran of the U S Army serving for 12 years in the 101st Airborne Division and served in Operation Desert Storm. Bill was an employee of the U S Postal Service for 22 years at the Northwest Annex. He is preceded in death by parents, David Doneski Sr. and Betty Sliger Doneski; brother, Ricky Doneski; sisters, Judy and Janet Doneski. Bill is survived by his daughter, Jessica Doneski; son, William George "Billy" Doneski Jr; grandchildren, Malachi, Lincoln, Lyneia, Jaiven and Aria; brothers, David Doneski Jr and Tim Doneski Sr; sisters, Debbie Halterman and Cindy Peacock; several nieces and nephews. The family will receive friends from 5 to 6:30 p.m. on Wednesday at the Click Funeral Home Middlebrook Chapel with a Celebration of Life to follow at 6:30 p.m.
Family and friends will gather at 2 p.m. Thursday at the East Tennessee State Veterans Cemetery for graveside services with full military honors conferred by the U S Army and the East Tennessee Veteran's Honor Guard. Click Funeral Home, 9020 Middlebrook Pike is serving the Doneski family. To send flowers or a remembrance gift to the family of William George "Bill" Doneski Sr., please visit our Tribute Store. "Email Address" would like to share the life celebration of William George "Bill" Doneski Sr.. Click on the "link" to go to share a favorite memory or leave a condolence message for the family.